Welcome! Or as they say here in Nepal, Namaste! This Gracefulfitness blog is a forum to share my passion for exercise, wholesome food, and all around healthy living with YOU! Gracefulfitness is all about infusing life with consistent exercise and healthy living. I want to share with you how I have discovered a lifestyle where exercise and a whole food diet are integral to my happiness and a real source of pleasure rather than stress. Perhaps most importantly, Gracefulfitness is an ongoing process and ever-evolving as we age, change jobs, change homes, change seasons, build families. I hope my journey of maintaining a lifestyle that gracefully fuses fitness and “real life” will inspire and maybe educate you, or at least entertain! I love salad that eats like a meal-substantial with a good variety of textures and flavors. One of the harder things about traveling for the last four months has been eating well. Tate and I play a game when we are hungry and feeling less than enthusiastic about another cheap restaurant meal, it’s called “if I could eat anything…”. Usually in my veg and raw food deprived state my answer is ” a giant hearty salad!” So, when I find that rare restaurant that knows how to make a salad, like a real salad, I return and return until we leave town (thinking of a certain restaurant, or more specifically a certain salad, in Puerto Iguazu, Argentina. Luckily they apparently had amazing steaks also and Tate was happy to return every night for 3 nights. Or was it four?). 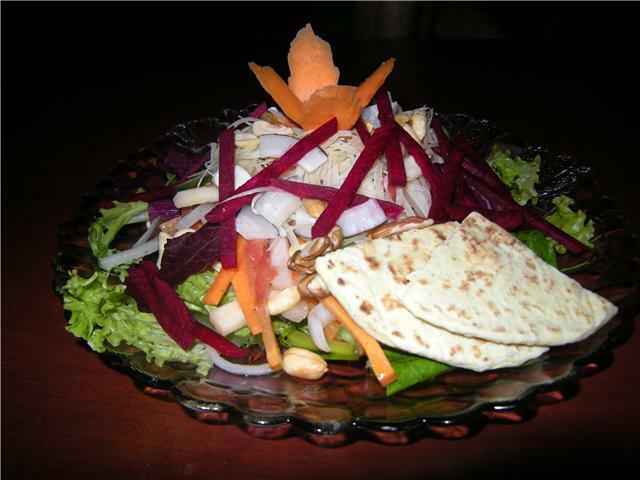 Here in Kathmandu Green Organic Cafe has tempted and delivered three times already with their amazing salad. The first time I ate said salad I was literally moaning with pleasure as I ate and then talked about it for a good two hours after. It’s a good thing dinner was health-on-a-plate because the rest of the days eats were a bit random and perhaps less than virtuous. Breakfast started with two fried samosas bought from a street vendor for 7 cents a piece. I usually avoid fried food because it makes my stomach yucky but, damn, these were good! Totally worth the greasy fingers. Today was a very active day, we hiked for at least four hours in the hills surrounding the Kathmandu Valley. It felt great to work up a sweat and get my heart pumping. After 15 months of running consistently (2-4 times a week) I have only run once in the last month! Luckily, our days in Nepal have included many big hiking days and lots of walking. Plus, I have gotten really into my interval workout and actually did it twice this week! Here is a link to my latest favorite workout. I extend it to last 35 minutes by adding jumping jacks, stair runs, jump rope, basically anything to keep my heart rate high, and run through the whole thing three times. Let me know if you want more details on my workout and I can post specific times, reps, etc. Warning! The first time I did this workout my inner thighs were sore for days!